I love Sublime 2. I never thought something like Sublime would be something I’d love, but I really do. I thought, “It’s just a text editor. What is the big deal?” It is so much more than just a text editor, but it gets the majority of its use from me as one and I could not be happier. 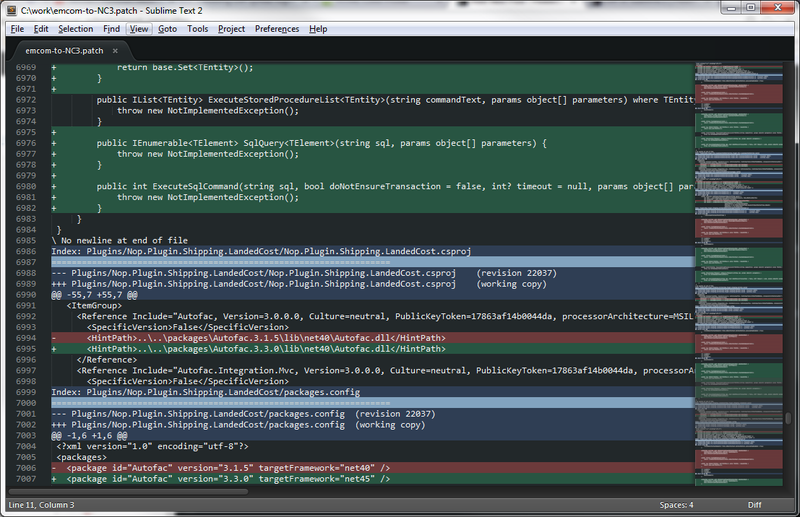 I was recently working with some diff’ing using WinMerge, and I generated a patch file. I did not want to initially apply all the chages from the patch, but there are some pretty good code changes from the newest version of NopCommerce that I would like to add to our site, so I thought I’d cherry pick. I opened up the patch in Sublime, and too my dismay found there was no color highlighting even the the syntax selection was correct. A quick google and I found this post about editing the theme to fix the problem. Yet another thing to love about Sublime 2. Here are the steps I took to get at the theme easily and the edits I made. What was the coolest part for me was the fact that Sublime 2 supports alpha. I had a hard time getting the colors exactly the right shade for my theme, so I tried adding alpha, an BAM! It worked. All I had to do was tweak the alpha to get the colors to fit to my liking. I think it fits in pretty well with the rest of the theme. I am super-stoked! Another really cool think was how easy it was to hack the theme. The link shows how to use foreground coloring, but I really wanted “highlighting”, so I wanted to use the background color. It was intuitive to assume I would simply change “foreground” to “background”, and I double-checked to be sure. 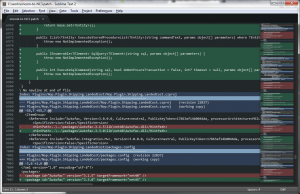 I also really liked that the instant I saved the theme it was updated in my running instance of Sublime 2. Awesome!